More than 20 years later, It still works great! Bought this stand in the early nineties to complement my Portaband saw. I remember being anxious over the purchase as it was quite pricy. Well, right from the beginning it became a valued tool in the shop. And now over 20 years later, it works as well as it did on day one, including the saw (although the saw has had wear parts replaced), one of the best tool accessories I ever purchased. I use this bandsaw stand to cut conduit for custom handrails. I am so happy and proud to have this addition to my band saw artillery collection. It is the perfect compliment for the porta band..
Use with my 28 volt bandsaw. Attaches and unattaches easily. Well built product. use it in field. seems to be pretty durable. would recommend this product. Does this cut miters on angle iron? BEST ANSWER: Your question will be best answered by the manufacturer, who can provide you with the accurate information. The number to reach them directly is 800-729-3878 or online at www.milwaukeetools.com. Will this stand work with all 120 volt cord type Milwaukee band saws? If the band saw is corded, you will have to purchase the 48-28-0265.
can you buy just the adaptor? Will the portable bandsaw stand work with the 2729-20 model bandsaw? BEST ANSWER: Yes, works with all Milwaukee portable band saws. Will this item work with 6230 band saw? BEST ANSWER: Milwaukee does not provide any exclusions to this item, therefore this table should be compatible. 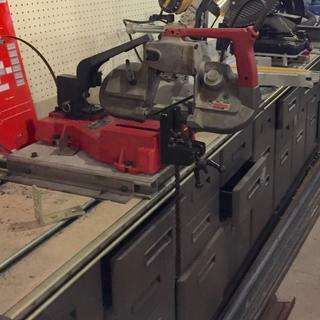 Will this work with the M18 bandsaw (which I currently have) and the M18 Fuel Bandsaw (which I am intending to purchase)? Does this allow you to make angle cuts? will this accept model 6238-20?